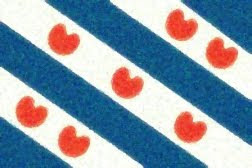 Fun With Frisian: GRAACH - "willingly, readily, heartily"
Let's look at a few basic polite phrases today. As some readers may know, tanke wol is "thank you" in West Frisian. Say tanke with an "ah" as in "father and a schwa. TAHNkuh. The word wol was discussed in more depth previously and means "well" or "willingly" (it can also mean "wool"). Say it with a full "oh" as in "road" and a v- at the beginning. VOHL, like the English word "vole." The English phrase "you're welcome" is graach dien in Frisian. Graach (listed under graech in P. Sipma's glossary) is pronounced with a particularly long "ah" as in "father" and a final consonant that is similar to a -g in English. GRAAHg. This word has many meanings, including "willingly," "please," "eagerly," "gladly," "preferably," "openly," and "rather." Dien means "completed," "done," "over," or "ready." Say it with a long "ee" as in "dean" and with a slight schwa after. DEE-uhn. And on this note: many thanks to Mama Lisa for linking to this blog from her website! If you do know more about the song De Maitiid, please be sure to contact her.